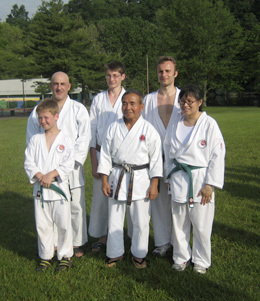 Mr. Raiola with Mushin Dojo students alongside Miura Sensei at ISKF Camp. Mushin Dojo enrolls both children (ages 7 & up) and adults of all ages. Classes are taught separately for adults and children and are offered 3 days per week. Each class is typically 90 minutes. Please see our class schedule for more information. Additional Fees: $20 Registration fee, Dojo Patch $10. Please ask about current sales and discounts. Membership fees and class schedule are subject to change without notice. Please contact Mushin Dojo for full details. © Mushin Dojo 2009-2011. All Rights Reserved.